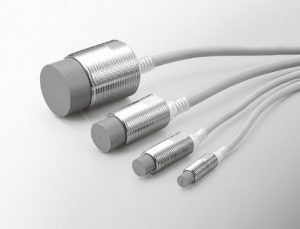 FL7M Series Unshielded DC 2-wire Cylindrical Proximity Sensors. The unshielded version of the venerable FL7M DC 2-wire cylindrical proximity sensors have two times the sensing distance of the regular FL7M. The stable sensing area is shown by the setting indicator and the firefly glow of the indicator lamp can be seen from any direction. The sensors are sealed to IP67G and have a non-polarity function that reduces wiring costs and errors.